Living a long healthy, vital life means protecting your body from deadly disease. That means keeping your immune system functioning in peak performance. Truth is, we’re more in control than we give ourselves. Most diseases are the result of lifestyle habits and a broken immune system. The immune system is responsible for protecting us from illness and fighting off infection and foreign invaders. So, we would be wise to nurture and protect our immune system. The best way to do that is through exercise. The strength of the muscular system is interconnected with immune system functioning. Any reduction in physical condition means a weakening of this system. The end result is that inactivity is the major factor that leads to many diseases. At the top of the list is cancer – not a pleasant thought for sure. Our muscles are more than just a way to shape our figure and give us strength to perform our daily activities. They are storage sites for the proteins needed to produce anti-bodies, white blood cells and killer cells. These cells detect and destroy lethal cancer cells. Muscles are also storage sites for the amino acid glutamine and other proteins that are the immune systems fuel source. The more toned, strong muscle tissue you have, the more plentiful the supply is and the greater protection you have. This stored protein is a reserve to be called upon when needed to help fight and recover from illness. The reality is our muscular system makes up 50 percent of our bodyweight so it’s not hard to grasp the fact that any unnecessary loss of muscle is critical to our overall disease protection. Studies have shown that sedentary, inactive people are three times more likely to die of premature and preventable disease. So, if avoiding disease somewhere down the road of life is important to you, if living a long, healthy vital life is part of your dream then you must tend to your muscles now. They must be kept in tip-top condition – strong and toned at all times. Since most people do not have jobs that require manual labor, we must put intentional exercise in place if we wish to experience a disease free, long healthy life. A strengthening exercise program is the only way to reboot entire body strength and bolster disease protection. It directly engages the muscles that help keep hormone levels healthy. This is an important factor as high levels of certain hormones can increase the risk of disease…including cancer. Recreational activities such as walking and swimming are good and contribute to your health. However, these low intensity exercises won’t get the job done. You must engage and work all the major muscles through their ranges of movement under an adequate load. This is the way to build and maintain strength. Next time you look in the mirror at your figure, expand your perception about your muscles and see them as your armor and defense against disease. They are not there to provide shape and body strength only. 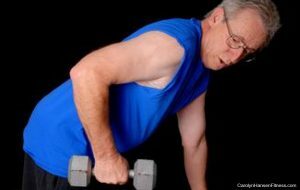 If you fail to challenge the muscles to stay strong they will continue to weaken and your disease risk will increase.